i'm not sure about you, but at my house the flies have arrived and i see them going nowhere soon! i try to be so careful when closing doors but the little critters never cease to find their way in still. 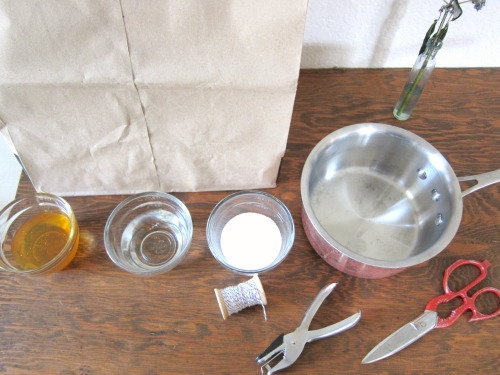 instead of using harmful chemicals or pricey fly traps, i made my very own fly paper at home with household ingredients and materials, and it was so easy! first, cut your paper bag in to 4" strips and punch a hole in the end of each of them. cut a piece of string for each paper strip and loop it around the hole. 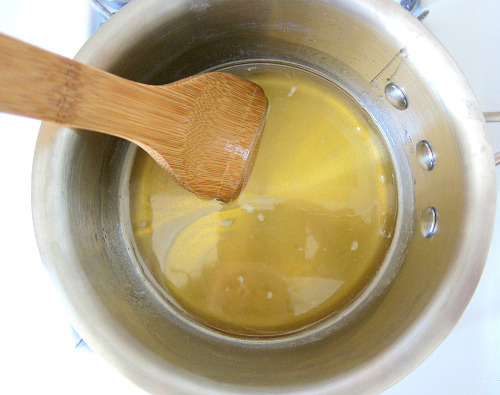 combine the honey, sugar and water in your pot over med high heat and cook until the mixture is well dissolved, then turn off the heat. dip each of your paper strips into the mixture, making sure to coat it really well. hang your strips up 'to dry' on another string. you'll want to put something underneath them to catch the sticky drips that are sure to fall, like a piece of newspaper or a baking sheet. leave them here until they've stopped dripping- about 30 minutes. hehe thank you betsy! funny that flypaper can be kinda pretty, lol. Thank you so much for posting this recipe and step by step instructions. This is definitely something I can use and love the fact that I can make them myself at home. Kudos! I am definitely going to try this come summertime! I detest the horrible little things so much but I don’t like to use spray. This is such a wonderful idea!! Thanks so much for sharing and i am really loving your very inspiring blog. Have a lovely merry happy day and love to you! Has anyone tried this? Does it work? How long before it dries out? It can be a great activity for kids too…you can have them color with a crayon so it won’t bleed, that way they can have some fun too, and you won’t have to just look at a brown paper strip :-) Maybe not color the entire thing, though, as the wax from the crayon might decrease the sticky area??? carly, what a great idea! i haven’t experimented with it so i’m not sure about they stickiness, but i’m sure it would be fine! have fun! How about a review? How well does this work? I’ve tried several different types of contraptions/sprays, etc. Thanks for posting this, but how effective is it? Thank You! Another poster from above mentioned coloring these. That gave me the idea to draw several little black flys on the strips, before coating them, to catch the eye of the fly that I want to die. Dh made some and it did not work at all…just wasted my honey. The water ratio seems a bit high maybe? Either way we are so irritated by these flies….free we are going to try the jar of water with jam in it. hi michelle, so sorry to hear this! it always works really well for us, and i’ve found that i prefer this method to any others i’ve tried. that said, let us know how the water/jam jar works! Thank you for the sticky fly strip recipe. I am going to try using your recipe to coat toilet roll cylinders! I tried these last week and didn’t catch any flies….I saw some land on them, but they flew right off again…not sure what I did wrong…did I maybe keep it on the heat too long? Not long enough? Did I soak them too long? not long enough? I have no clue, but have you ever had a ‘bad’ batch? hey kl! hmm, how weird! i’ve never had a bad batch and feel like they definitely should had stuck to it! perhaps try a little less water and see if that helps? I loved this idea and had fun preparing the sticky strips. Unfortunately they have not worked for me AT ALL — wasps, house flies, and even tiny little fruit flies are all able to land, eat the sweetness, and then fly away. :( I was pretty disappointed. Good thought and cheep too. Except it does not work. I was looking for fly paper not a fly feeder. Ty I’ll keep looking. I made these this morning, and before they had even completely set up they were catching the flies in my kitchen. I’m diffinately going to keep this recipe, and share it. Thank you very much. How long will it remain sticky? This didn’t work for me at all. I had hundreds of flies land on them, but they were able to fly right off.